The World Health Organisation (WHO) has said it feared outbreaks of infectious diseases due to dirty water and people fleeing fighting nearing Tripoli, where it has about two weeks of emergency supplies for hospitals and health facilities. After a week of fighting, 75 people have been killed and 323 wounded, including seven civilians killed and 10 wounded, said Dr Syed Jaffar Hussain, WHO representative in Libya. The WHO has delivered trauma kits and medicines to hospitals, he said, adding: "These supplies will last for two weeks, the acute phase." So far 6,000 have fled the fighting but WHO has contingency plans in case "thousands if not hundreds of thousands" are displaced. Yesterday, gunfire and blasts echoed through Libya's capital as eastern forces fought troops of the internationally recognised government in southern Tripoli suburbs, forcing thousands of civilians to flee. 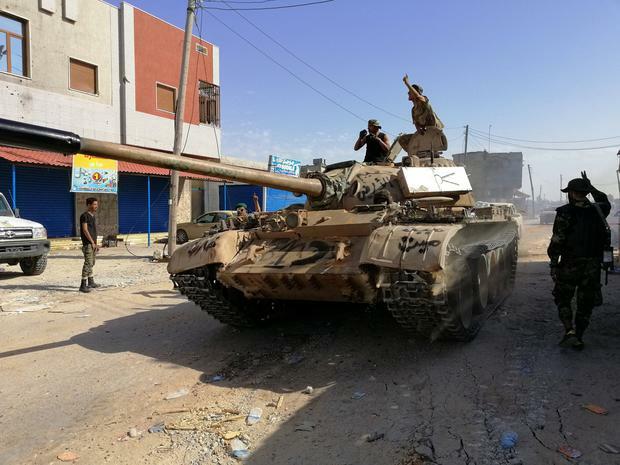 The Libyan National Army (LNA) of Khalifa Haftar advanced on the coastal city a week ago in the latest conflict of a cycle of anarchy since the 2011 overthrow of dictator Muammar Gaddafi. But armed groups loyal to Prime Minister Fayez al-Serraj have so far kept them at bay, with fierce fighting round a disused former airport about 11km from the centre. As the sound of fighting echoed round their city, residents sought to maintain some normality yesterday. Some families were having breakfast in cafes next to the fish market where people were stocking up for the weekend. "We have got used to wars. I fear only in God," said Yamim Ahmed (20), who works in a fast food restaurant. As well as the humanitarian cost, the conflict threatens to disrupt oil supplies, increase migration across the Mediterranean to Europe, scupper a UN peace plan and allow Islamist militants to exploit the chaos. Mr Haftar (75), a former general in Gaddafi's army who later joined the revolt against him, moved his troops out of their eastern stronghold to take the oil-rich, desert south earlier this year, before sweeping up to Tripoli this month. Mr Serraj's government has managed to halt the advance, helped by armed groups with machine-guns on pick-ups and steel containers across the road into Tripoli. The UN, which had hoped to organise a national conference this month bringing the rival eastern and western administrations together to organise an election, has called for a ceasefire. The United States, G7 bloc and European Union have also urged the LNA to halt its offensive. "We had hoped there would be a national conference, not fighting," said Sulaiman, a businessman enjoying coffee with friends. "Unfortunately, after 40 years of dictatorship we don't have the right political way to express ourselves, we don't want military rule or militia rule." "We are keeping a very strong eye on outbreaks because of displacement into places, and the water sanitation system is compromised. So there is a huge likelihood of outbreaks," said Dr Hussain. Mr Haftar casts himself as a bulwark against Islamist militancy who wants to restore order to Libya. He has so far resisted UN pressure to accept a power-sharing settlement, using his leverage as an ally of the West in attempts to stem jihadists in North Africa. "Refugees and migrants trapped in detention centres in Libya are completely dependent on authorities and the humanitarian actors for basic services," tweeted aid agency Medecins Sans Frontieres.